The tenets of a misfit-type team in fiction like the Suicide Squad aren't secret nor complex -- despite whatever dislike or misgivings the teammates might have about one another, the only place they fit in is together, and so the team thrives. This might be boilerplate, but I haven't seen it presented so well as in Sean Ryan's New Suicide Squad Vol. 3: Freedom, his final full book of the series -- in which everyone confronts that their "freedom" doesn't really mean being free. Ryan brings his trilogy to a head here with Amanda Waller versus her middle-management nemesis Vic Sage; I am not wholly sure everything that could have been said at the end of this story was said as well as it could have been, but there's a variety of interesting character arcs. In all Ryan should be credited for putting the Suicide Squad title on a much-needed upward path. As has been the case for much of Sean Ryan's New Suicide Squad run, Freedom mixes high adventure with concerns both great and mundane. When you boil it down, the stakes here are exceptionally low -- workaday government agent Vic Sage was assigned to run Task Force X, had a conflict with his subordinate Amanda Waller, and was recruited for a corporate job instead. In the real world, Sage might have simply quit one job and taken the other, except for his exceptional dislike of Waller and the requirement that he leak information about Task Force X before taking the job at Calvary. Even then, in the immediate setting there's no civilians imperiled or planets exploding -- the conflict here for the most part is whether Waller can simply stop Sage before he reveals Task Force X to the world and ruins her position and livelihood, not very much more or less. That's a curious scenario to inject the Suicide Squad in to, and one in significant contrast to New Suicide Squad Vol. 2: Monsters, where the Squad had to stop a time-traveling bomb from erasing modern industry. Taken as a whole Ryan has a nice set of books here -- New Suicide Squad Vol. 1: Pure Insanity, a pair of semi-satirical stories that served perhaps covertly to endear us to the book's main cast; Monsters, a far more serious and "traditional" longer-form Suicide Squad story; and then Freedom, which picks up in emotion what it lacks in the flash-bang moments that one perhaps expects from the Suicide Squad title. In that I have little expectation we'll see this particular Vic Sage again nor that Ryan will specifically return to these storylines, Sage remains a curious piece of this whole endeavor -- why Ryan chose to tie him to the legacy of the Question instead of just creating a new character. The Sage character was not in the end particularly evil or particularly maniacal, kind of just a guy who can't brush off not getting his way that easily, at least until he murders Waller's secretary Bonnie. That's a turning point for Sage, though expected as it was (we've known from the start the triangle of Waller, Bonnie, and Sage would come to a head somehow), I wasn't completely satisfied. Bonnie emerges ridiculous here -- she can't reach Waller on the phone one time, so she panics and declares that Waller's gone rogue -- and that catalyzes Sage to enact his plan to reveal Task Force X; the "precipitating action," as it were, feels false. And then when Sage shoots Bonnie, it raises the exceptionally low stakes of this book up just a bit, enough for Waller and Sage's conflict to matter on more than just an interpersonal level -- but sixteen whole issues of Waller, Sage, and Bonnie just for Bonnie's purpose to be to give some legs to a picayune conflict seems like a lot of build-up without much payoff. Of course we understand, along the overall themes of these books, that Bonnie's the one who pays because Bonnie's the lowest in the pecking order, and Ryan's New Suicide Squad is all about the higher-ups not understanding or caring about the plight of their subordinates. Just before Waller finds out about Bonnie's death, Ryan has Waller reveal that she tricked the Squad and won't be offering their freedom in exchange for helping her take down Sage; just after, Waller goes to Deadshot to find out why he saved her life from Black Manta when Deadshot himself tried to kill her. Presumably Waller already knows the answer, or realized it at Bonnie's funeral, that Bonnie was the only character who was "free" here, with a husband and family outside the Squad. Deadshot acknowledges that being forced to be on the Squad gives him a purpose and a place to be himself, and demands the same is true of Waller; she doesn't admit it, but clearly it's the case. For as much as Ryan's Squad has demonstrated an "employer" versus "employee" dichotomy, in the end Waller and her Squad are one and the same. Again, that's nothing new in Suicide Squad lore, but Ryan's final conversation between Waller and Deadshot Floyd Lawton is smart and elegant. I haven't seen a Squad conversation that frank in a while, and especially not between Squad stalwarts Waller and Lawton. Black Manta emerges as a villain in this piece, which is interesting given Ryan positioning him as the book's hero in Pure Insanity. In that first book, Manta was the voice of reason amidst the chaos, bringing order to a Squad spinning out of control, but in Monsters, Manta bristled against the Squad's continuing chaos, seeming to go over to the side of the rogue League of Assassins for a while. That mission ended ostensibly with Manta in the government's good graces, and there's no explicit reason given why Manta was left behind and not brought on Freedom's mission, which might've put him on the side of the "angels" in this story. Manta's loathing of Waller in this book seems sudden and out of character, though even Waller's "friends" Deadshot, Captain Boomerang, and Harley Quinn attacked her when they had the chance. But, Manta did have conflict with Boomerang in Monsters, and Boomerang has a longer history with the Squad than Manta does. Additionally, within these volumes Manta has represented Ryan's paragon of order, and Boomerang the chaos (with Deadshot often in the middle); Manta wants the world to function with ruthless efficiency, while Boomerang sees no point to anything that isn't fun. In Manta's fall, the book is choosing Boomerang's nihilism over Manta's surety of purpose, and we see this too in Waller finally embracing her position with the Squad. Calvary's corrupt CEO accuses Waller of purposefully causing violence and chaos, and in Waller and the team coming to accept their need to be part of the Squad, there's suddenly no place for Manta in the book's aesthetic. In some respects for the Squad to become true to itself it must eject its healthiest member. Freedom collects the first issue of the Suicide Squad Most Wanted: Deadshot/Katana miniseries, which isn't optimal padding frankly since that issue can be found elsewhere. I'll reserve comment on the content itself except to say that the Deadshot story does eventually seem to take place (minorly) in the direct aftermath of Freedom. For the Katana story, I think the editors would have done well to include some explanation of what this story is instead of just tacking it on. Plenty of readers are probably in the know, but there's no in-book explanation for why a story about Katana, not a member of this Squad, is included here, and probably it's not a good idea to leave a potential reader guessing. 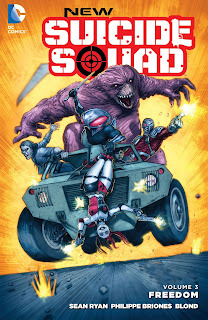 In all Sean Ryan's New Suicide Squad has been a nice surprise. Of DC's "new" books about this time (relaunched Suicide Squad, Deathstroke, and Teen Titans), none of the three started very strongly and frankly the relaunches seemed a mistake, but Ryan's Suicide Squad leveled off and ended strongly with his last two books. New Suicide Squad Vol. 3: Freedom brings the book to a satisfactory if rushed conclusion, and makes me much more optimistic for the rest of Suicide Squad in DC You and on to Rebirth.